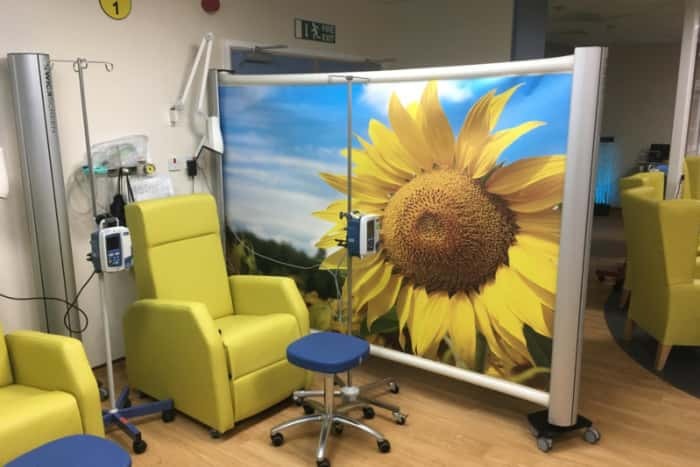 This much needed facility will be based in Hartlepool Hospital and will help detect women’s cancer at a much earlier rate. 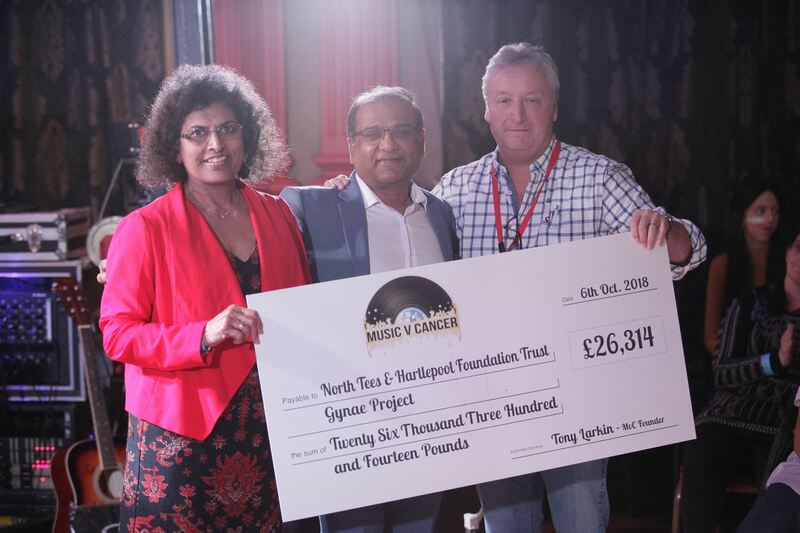 Dr Mary George accepted the cheque from Tony Larkin and Dr Anil Agarwal at the last MvC Live Sessions based at The Grand Hotel, Hartlepool. 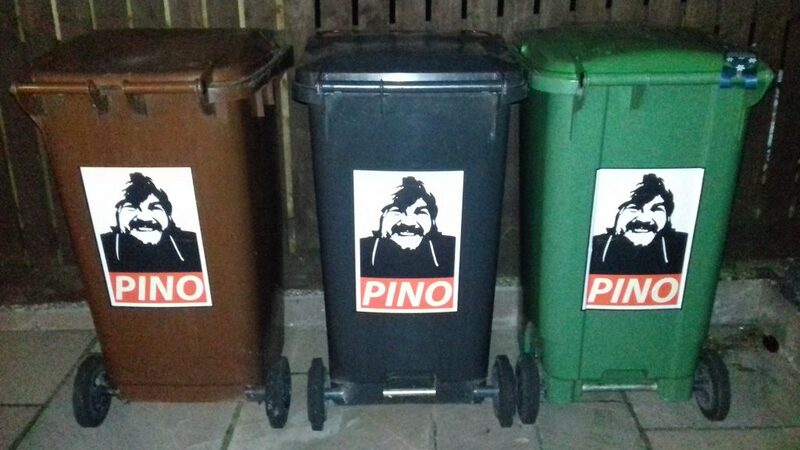 6th October 2018. 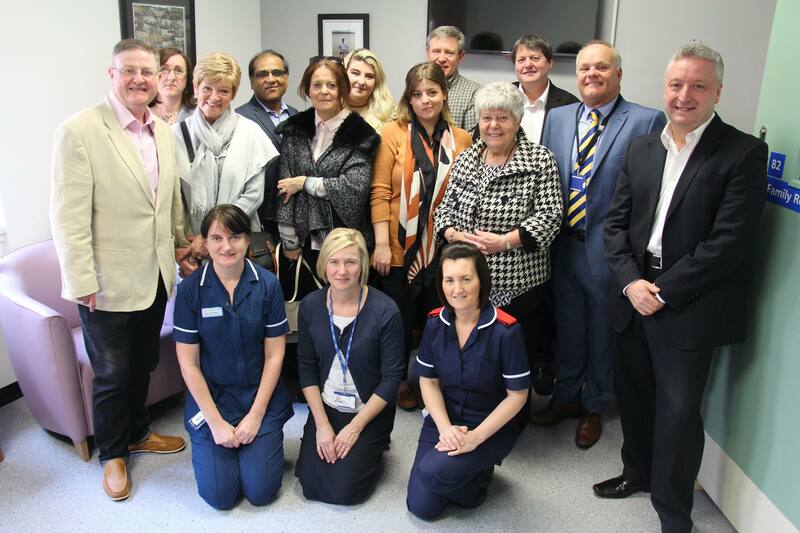 MvC fund much needed Gastro Dummy for Hartlepool Hospital Endoscopy Academy which was also funded by MvC back in August 2015. News to follow soon. April 2018. 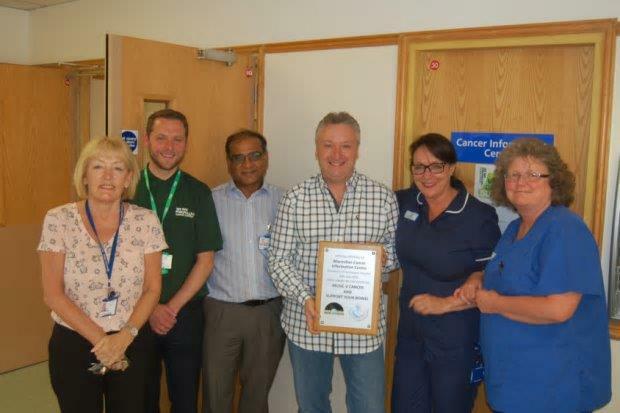 New Family Room for the Chemotherapy Ward, University Hospital of Hartlepool in memory of Andy Brown (MvC coast2coast Fundraiser) – £8,000+ Investment. April 2017. The Cancer Information Centre, at the University Hospital of Hartlepool, is back up and running following a £1,000 donation from Music v Cancer and its associated charity, Support Your Bowel – July 2016.
were present at the opening of the new Macmillan Cancer Information Centre in North Tees Hospital today which the two charities donated a combined £5,000 towards the new facility in June 2016. 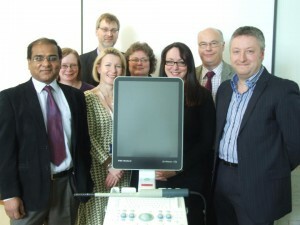 MvC purchase equipment for new Endoscopy Academy based at the University of Hartlepool Hospital – £15,000 investment. 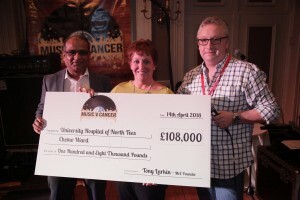 Music v Cancer have purchased two video cystoscopies for North Tees Hospital costing £37,000. 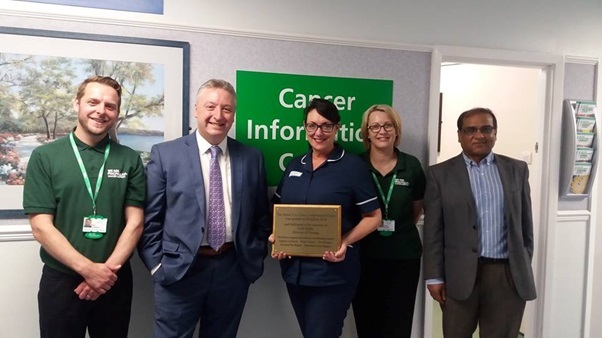 The machines can not only detect and give specialists a clear view of the early stages of cancer but can also treat patients and carry out small procedures. 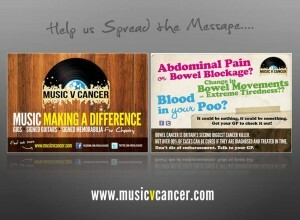 MvC Postcard Campaign – April 2014 (Bowel Cancer Awareness Month). 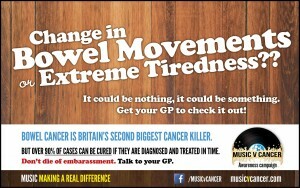 10,000 awareness postcards distributed via the Hartlepool Mail. 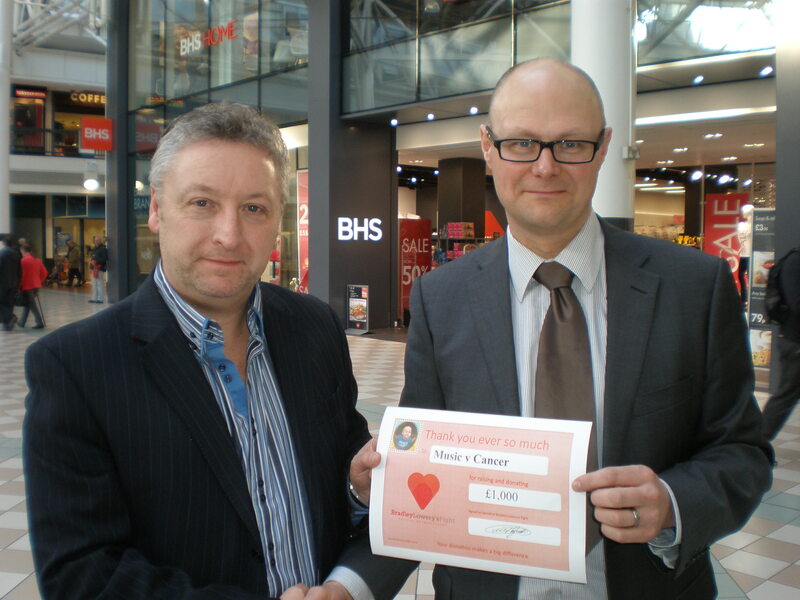 Presentation was made by Tony Larkin (MvC Founder) to Mark Rycroft (Bradley Lowery Fight Fund Manager) in the Hartlepool Shopping Centre. MvC organised a weekend in London for terminally ill cancer patient Ann-Marie Noble which included meeting Sir Terry Wogan at the BBC’s Radio 2 studios. 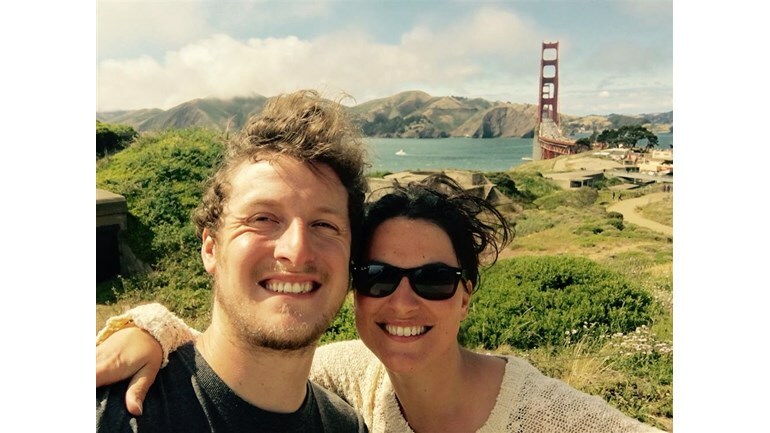 This was one of Ann-Marie’s wishes on her bucket list . 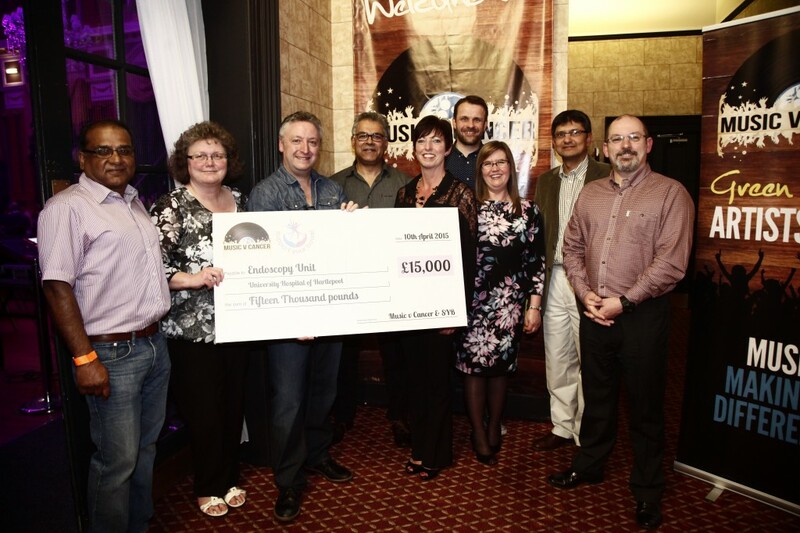 Hays Travel were also part of making this dream come true. 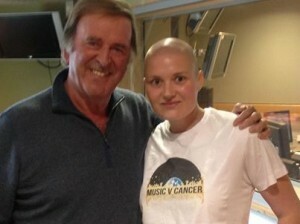 Thanks to Sir Terry Wogan and his team at BBC Radio 2 for giving up their time to meet Ann-Marie. 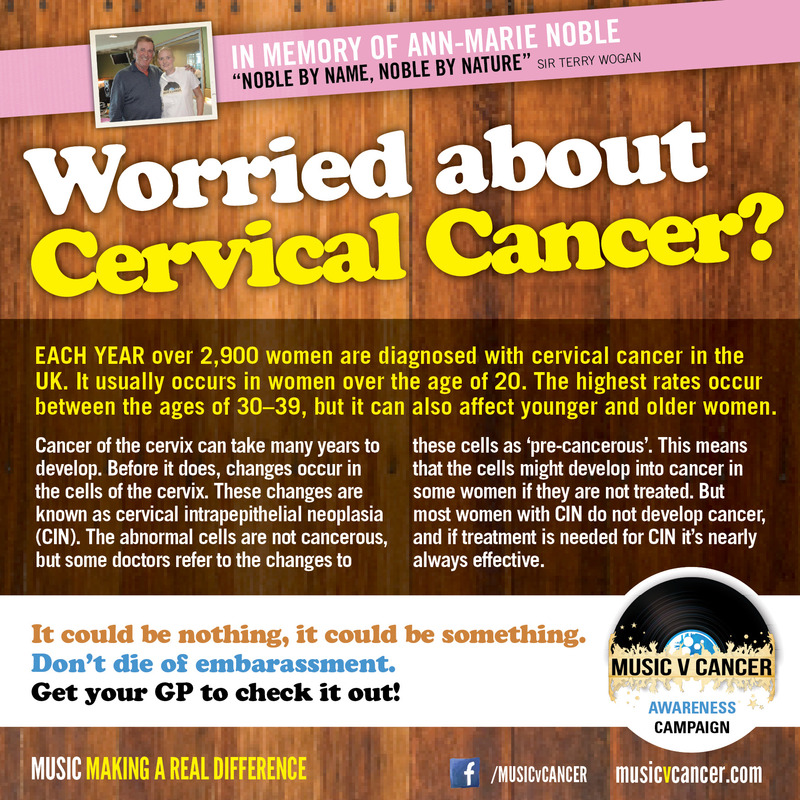 MvC Postcard Campaign – July 2013. 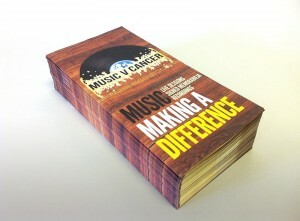 10,000 awareness postcards were printed for use at the Stockton Weekender in July 2013. * Bowel Cancer Awareness Campaign – Hartlepool Mail April 2013. Below: Examples of adverts which ran in the Hartlepool Mail newspaper. 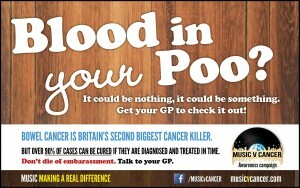 Hartlepool has the highest death rates of Bowel Cancer in the UK (Stats 2011). 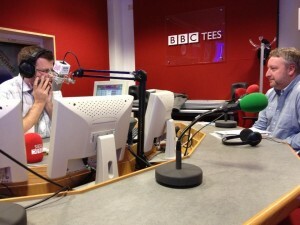 Bowel Cancer Awareness Campaign – Radio Hartlepool April 2013. 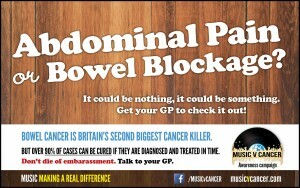 A series of bowel cancer awareness adverts ran on air for a month. Joint initiative with Support Your Bowel – Radio Hartlepool Commercial Campaign raising vital Bowel Cancer Awareness – Oct/Nov 2011 and re-run from Jan-Mar 2012. 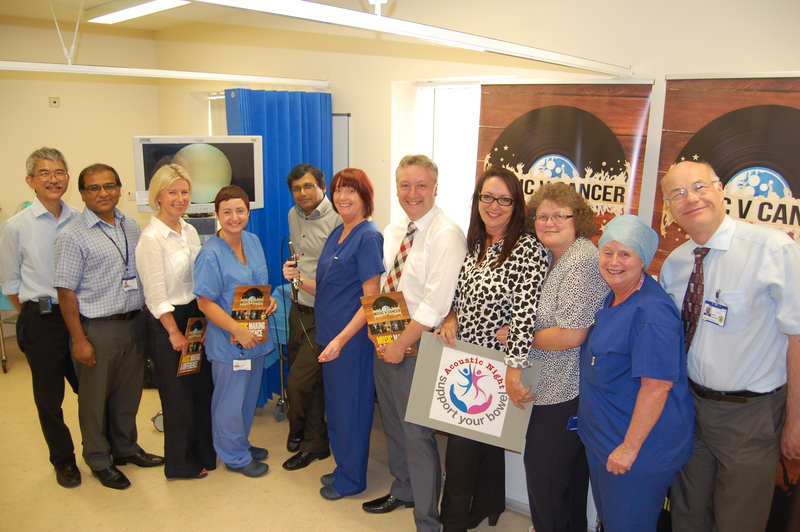 Joint initiative with Support Your Bowel (SYB) raising £63,000+ for a new Endorectal Ultrasound Machine for North Tees and Hartlepool Trust. The machine installed Feb 2012. 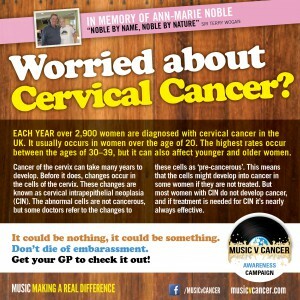 MvC Leaflet Campaign – 5,000 Raising Awareness. 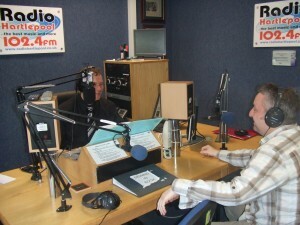 Feb 2012. 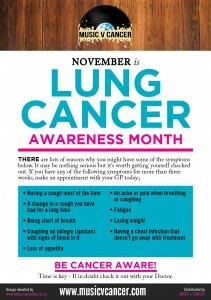 * SYB Leaflet Campaign – 10,000 Raising Awareness. Feb 2012. 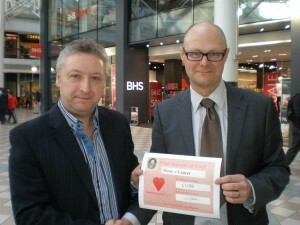 * SYB Leaflet Campaign – 2,000 Raising Awareness Mar 2011. 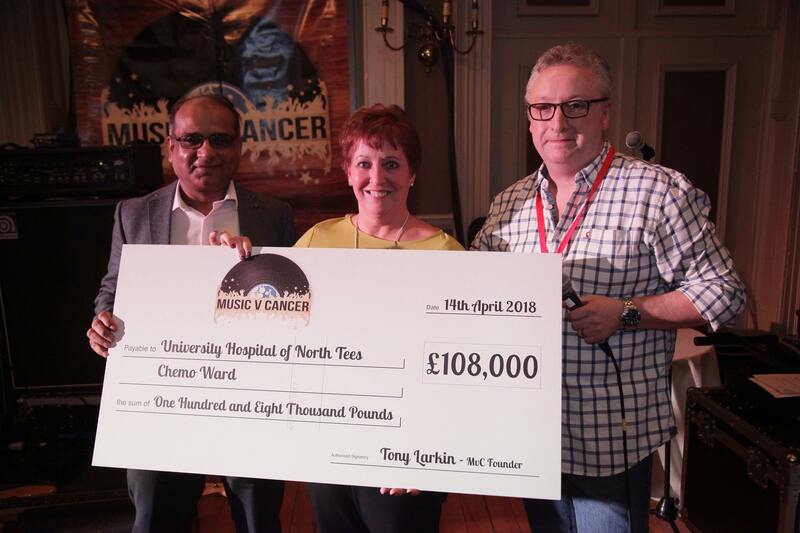 MVC have taken part in hosting a range of different music events and initiatives to raise funds, none of which would be possible without the people like YOU willing to help. 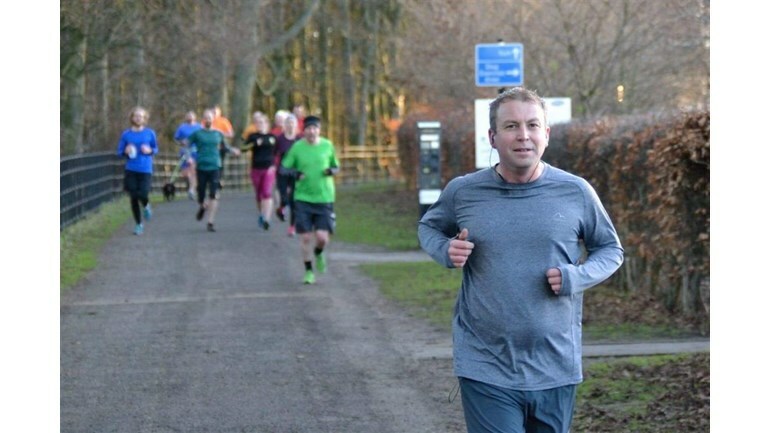 Why not get in touch and become an active participant? 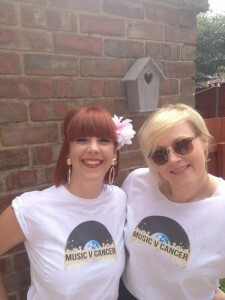 Planning on taking part in a fundraising event but unsure as to which cause to support then why not consider “MUSICvCANCER”. 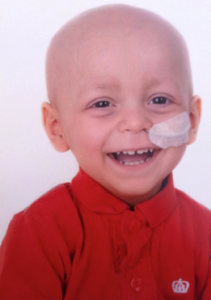 Please don’t hesitate to get in touch with your fundraising events and ideas.